Reading the post on Julia Maitland’s letters, one of our readers, Tony Fairman, was struck by the reference to “Dr Bell his sytem”. He kindly sent us his notes on Dr Bell, for others to read. The notes relate to the work Tony has been doing on Higher-class schooling of the Lower Classes: England 1800-70. 1797. Andrew Bell, An Experiment in Education, made at the Male Asylum of Madras. London. Preface. v. In the education of youth three objects presented themselves to my mind: to prevent the waste of time in school; to render the condition of pupils pleasant to themselves; and to lead the attention to proper pursuits. In other words, my purpose was to make good scholars, good men, and good Christians. 1844. Robert Southey, Vol. I. The Life of the Rev. Andrew Bell, D.D. LL.D. F.As.S. F.R.S.ED. Prebendary of Westminster, and Master of Sherburn Hospital, Durham, Comprising the History of the Rise and Progress of the System of Mutual Education. John Murray, London. Vols II and III by his son the Rev. Charles Cuthbert Southey. B.A. Vol. I. p. 185. No less than forty-six boys, in the lower classes, receive their elementary letters from a youth trained in the school himself, who learned his letters there, and who is not yet twelve years of age …. 1980. Denis G. Paz, The Politics of Working-class Education in Britain, 1830-50. Manchester UP. p. 4. the Anglican Andrew Bell and the Quaker Joseph Lancaster developed independently a method that promised cheap and efficient instruction for large bodies of pupils. Their method, monitorialism, was a system of instruction wherein the master taught each lesson to a group of able students (monitors) who in turn taught the rest of the children. Joseph Lancaster’s British and Foreign School Society was founded in 1808. Rev. Andrew Bell’s National Society (also known as The Madras System) was founded in 1811. Both were charity movements and aimed to teach reading, and mechanical writing to children of the poor, lower classes, aged about 7-12. Both also aimed to teach the children their ‘station in life’ through the Bible. Bell was Church of England and Lancaster Quaker. Apart from that religious difference, their teaching methods and content were identical. Neither taught children to compose or use writing for self-expression, but only to form the letters in the conventional ways, and to practise their lettering by copying from the Bible and other religious literature. Schools of both societies were started all over England by the middle and higher classes for the lower classes. Many thanks for sharing your ntoes with us, Tony. Tony Fairman is coming to Leiden to give a guest lecture on his work on minimally-schooled letter writers on 7 November 2012. 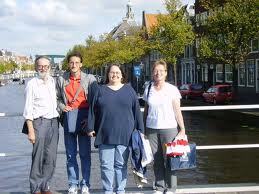 Tony Fairman (left) on a previous visit to Leiden (2007).